My mother was diagnosed with Jaundice on 15th August 2017. We consulted with a doctor from Ramachandra hospital, Chennai and they had taken blood samples and confirmed from the test results that the jaundice is not due to virus. He has informed us that the jaundice may be due to stones in gallbladder or cancer. During that time her bilirubin level was 6.0. They asked us to take some additional blood tests. Suddenly on 24th August 2017, my mother got severe abdomen pain and struggled to breathe following which we admitted her immediately in Ramachandra hospital. There they had taken CT scan, MRI scan, Endoscopy and PET scan and finally confirmed that my mother has a tumour in the bile duct which supplies enzymes for digestion. Based on her age, they suspected it may be a Bile duct (Cholangiocarcinoma) cancer. To reduce the bilirubin level, they have put Cather in her abdomen to drain the bile. Since there was no improvement in her health and the bilirubin level had increased to 13.5. we have shifted her to VS hospital, Chennai where doctors had Cather along with Stent inserted into her abdomen. After 60 days of struggle, the bilirubin level was brought down to 1.3. However she lost her weight by 14 kgs . 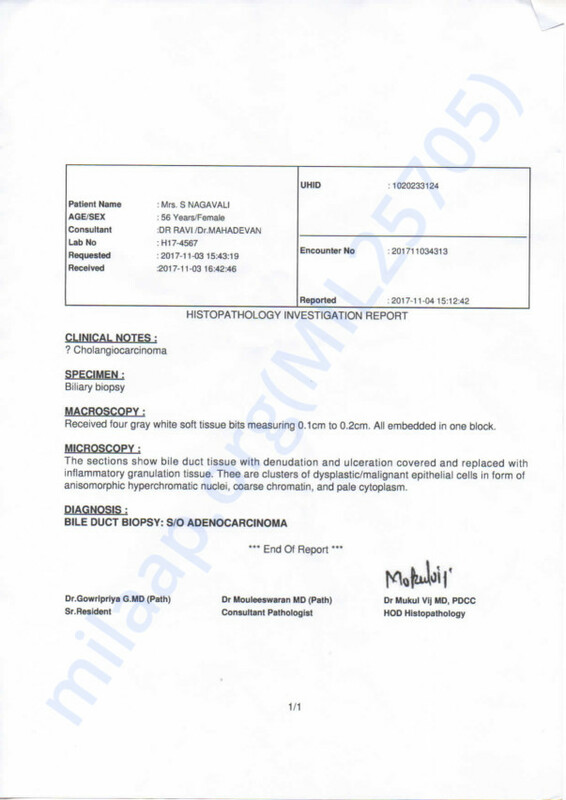 Further based on doctor's advice, we have taken Biopsy in Global hospital and the results confirmed that she had Adenocarcinoma, a cancer that is present in both her bile and lymphnode which is very close to the liver and the size of the cancer is also big, Doctor's suggested to go for Chemotherapy. After twelve cycles of chemotherapy, we were asked to take another scan and based on the results they have advised us to undergo surgery and continue with chemotherapy sessions. In this regard, i request your contribution for the above treatment. i have also enclosed my mother's biopsy result and estimate for the treatment. Here is an update on Nagavalli. 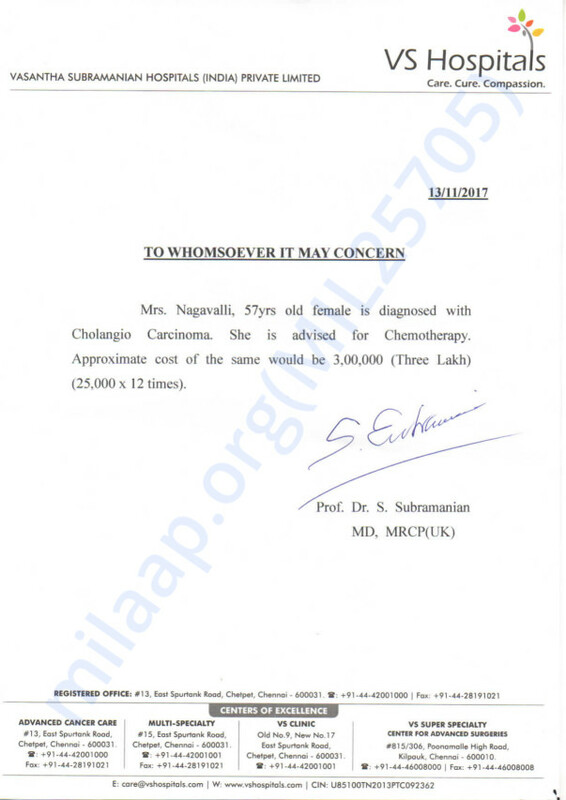 Nagavalli is currently at home and is undergoing chemotherapy sessions. The third chemo session is to be conducted in the last week of December. She has to undergo four chemo cycles in total. There are no major side effects of the chemotherapy. She is responding positively to the treatment and has gained her weight by 4kg. The funds raised will be withdrawn to meet the treatment expenses. Thank you for your support and love for Nagavalli. Please keep her in your prayers.